TME's offer includes ALS30 and ALS31 series capacitors with screw terminals from KEMET. These products are characterised by a wide range of operating voltage, maximum current, and long lifespan. Depending on the actual model, they offer capacitance of 150 µF to 100,000 µF, whereas operating voltage ranges from 25V to 500V. They come in packages of various sizes, and the ALS31 series additionally features a mounting screw. The capacitors are intended for industrial and commercial applications, which require high reliability and long service life. The most common applications include uninterruptible power supply (UPS) systems and switched-mode power supply units. They can also be used in voltage smoothing systems, energy storage systems, or in circuits with high pulsed energy consumption. 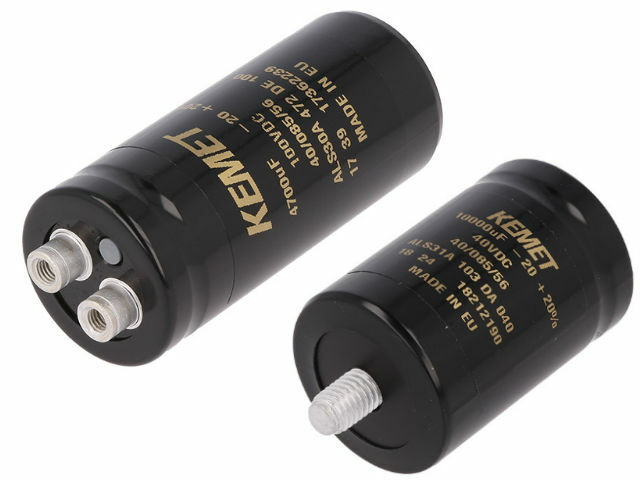 We encourage you to check out the ALS30 and ALS31 capacitors from KEMET.